Corporate benefits managers and human resource executives are searching for ways to effectively design and implement health plans to lower costs and improve the quality of care. Wellness and prevention initiatives are being adopted. Disease and condition management programs identify chronically ill populations. Education, communication, and incentives support information on healthy lifestyles and healthy choices. But, healthcare costs continue to rise. Lowering costs and improving quality is not about more management, additional programs, limiting formularies, or cost shifting. Real change involves participation, engagement, personal responsibility, and changing behaviors. The Center for Health Transformation believes that “Real Change Requires Real Change.” Nothing could be truer when developing a health benefits strategy for a corporation. Needed changes are beyond “creating a culture of health” or an “integrated health management” program. Changes are required across the broader corporate environment with consistent messages and emphasis on personal responsibility, self-reliance, ownership, and shared rewards. The latest plan design efforts to change behaviors and control cost increases is the adoption of consumer-driven healthcare plan (CDHP) designs. In limited forms, CDHPs are high deductible insurance plans with attached savings accounts. CDHPs have shown some promise, but many employers are hesitant to adopt CDHPs as their only coverage option. Employees are often sceptical of CDHPs. Employees are concerned about the potential for further cost shifting to them and the complexity of understanding healthcare options. Healthcare Consumerism is a more inclusive concept for engaging plan members. Healthcare consumerism is about transforming an employer’s health benefit plan into one that puts economic purchasing power—and decision-making—in the hands of participants. It’s about supplying the information and decision support tools they need, along with financial incentives, rewards, and other benefits that encourage personal involvement in altering health and healthcare purchasing behaviors. Healthcare Consumerism is independent of plan design. Healthcare Consumerism includes opportunities to accumulate funds through “shared-savings”. That is, plan members can be financially rewarded for doing the right activities that improve their health and save money. We are typically American. We want to be paid to do the right things. Good health is not enough. If it was, we would not still have so many smokers and Type II diabetes would not be at epidemic proportions. Incentives and rewards can include activities and results such as, participation in a wellness assessment, compliance with a condition management program (e.g. taking medications, diet, exercise, office visits), and maintenance of good health characteristics (e.g. blood pressure, cholesterol, nicotine use, body mass index). Trying to engage plan members in health improvements and healthcare compliance is a tough road to travel. Some companies seem be better at it than others. A comparison of two companies with identical characteristics can have dramatically different results. Below, medical plan costs have identical age, same gender, same tenure, same number of diagnoses, and some co-morbidities, and same region of the country. All factors we typically consider to affect costs have been normalized. 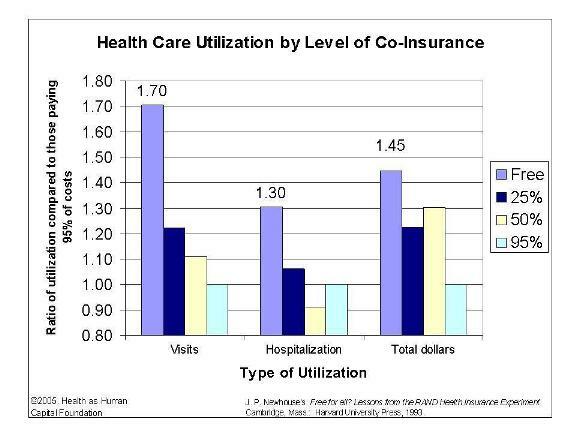 Yet, Co. #2 had 84% higher per member healthcare costs ($4,981 versus $2,705) than did Co. #1. Surprisingly, the reason is not directly related to healthcare. The difference is how employees are engaged throughout the organization. Healthcare consumerism embodies an attitude and benefits approach for how employees view themselves and how plan members are treated broadly by the employer. Developing personal responsibility and ownership for health and healthcare cannot exist in isolation from the overall corporate environment. Utilization differences and maintenance of health is a reflection of the overall development of an organization’s human capital and the understanding by each worker that their health is a critical part of the value they bring to the job. (3) Health – physical and mental capacity. Human capital identifies the key economic values of each employee and the potential compensation or worth of each individual for services provided. The relationship of health and healthcare to remain optimally healthy is a critical connection between corporate productivity interests and personal interests. Benefit managers need to understand this relationship within their organizations to design and offer benefits that maximize their investment in employee health and healthcare. If individuals can not maintain their health, their economic value to the corporation declines. If corporations do not assist and support the health for their employees (and family members) they will not receive the optimum productive value from their human capital. Many employees do not make the connection between maintaining health and their annual compensation and performance related pay. Many employers do not appreciate the impact made by the overall corporate environment to staff lifestyle choices, compliance with treatments, and the healthy activities of its employees. If personal responsibility is not a part of the evaluation of employees’ performance, work expectations, or other employment choices then expecting engagement by employees in health and healthcare consumerism is not realistic. Corporate humanity is the degree to which companies treat employees as rational intelligent adults. The HCMS studies show that companies that treat employees with respect and dignity in other areas of benefits and work assignments have lower healthcare costs. Engaging the intellect, creativity, and knowledge of employees must be a part of the overall business culture. Everyone seems to talk the game, but few really walk the walk. This is not a white collar or blue collar distinction. Employees of any skill or education level can be participants with idea generations, product and service improvements, and cost effective changes. Health benefit plans are only a part of the overall corporate environment of engaging employees and supporting good responsible personal choices. The following is a process for measuring alignment of corporate policies with personal responsibility and Corporate Humanity. This is an adaption of work developed by HCMSGroup. The results can also be used to determine if implementing healthcare consumerism will be optimally effective. There are related corporate benefits programs whose design can determine whether implementing healthcare consumerism will be successful. Award a point for each yes answer to the question if it applies to the majority of employees. The higher the score, the more likely a corporation is to reap the quality improvements, better health, and cost savings of healthcare consumerism. Are employees eligible for a performance bonus? b. Know that at lest part of their bonus is based on individual performance? It is possible to earn bonus or profit sharing that is greater than 10% of total salary? Can employees cash in unused sick leave or paid-time off (PTO) for extra pay? Survey result “Strongly Agree”: At my company, the people who succeed are those who earn it through their achievement. Do employees have a paid-time-off-bank instead of sick leave? Are employees compensated less than 100% pay during STD? Do most employees have a health plan out-of-pocket maximum of $3000 or higher? 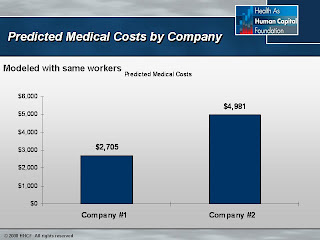 Do most employees have a health plan deductible of more than $1500? Survey result “Agree”: I protect my health because it is essential to having a successful career. Do you have a 401(k) available with at least a 3% corporate match? Do you have an HSA or HRA with an annual company deposit of $2000 or more? Do you have tuition reimbursement for educations? Survey result “Very Good/Excellent”: How would you rate your company’s emphasis on skill training? Do you offer a consumer-driven healthcare or healthcare consumerism plan? Do employees have access to support for financial decisions? Do employees have access to decision support for health and healthcare decisions? Are employees encouraged to make independent decisions work? Survey results “Agree”: My company asks for input about what benefits are important to workers. 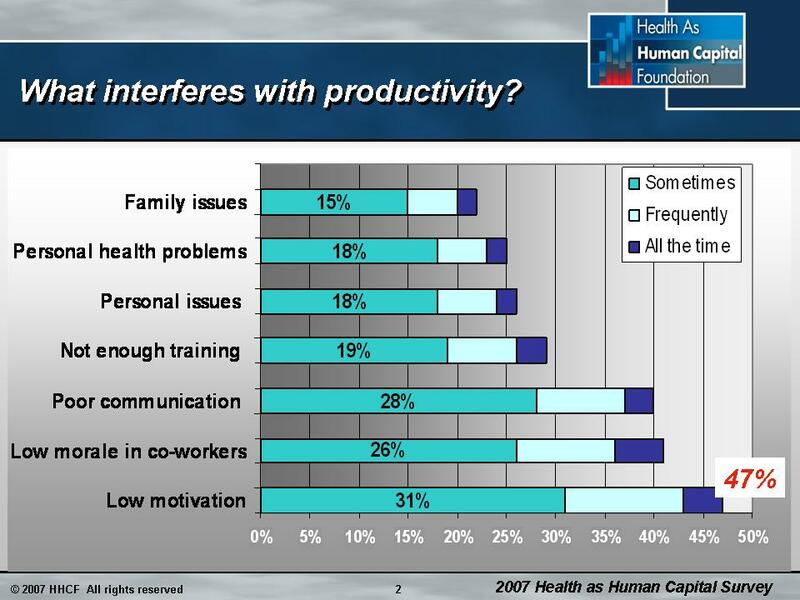 Employers inherently know that healthy employees are more productive. Healthy employees will have fewer sick days, increased productivity, improved presenteeism, fewer disabilities, and lower health costs. To create healthy workers, benefits managers have tended to change plan designs, products, and services to better engage employees in plan selection, treatment alternatives, care options, and lifestyle choices. But, these are not necessarily the real drivers of health and productivity. The Center for Disease Control studies show that 50% of health status is behavioral. This supports the notion that to lower plan costs it will require increased individual personal responsibility. That is the hallmark of healthcare consumerism. Other studies corroborate these findings. The Rand Health Insurance Experiment (HIE) proved that 45% of health expenditures are not driven by need, but because someone else paying the bill. Third party reimbursements distort norm economic decision making, minimize personal responsibility, and increase wasteful use of medical/surgical services. The HIE also concludes that the increase use of medical services and costs adds little to health and in many cases contributes to more negative outcomes. It’s time to get serious about real change. Medical benefits can be implemented that go beyond plan design and more cost shifting to employees. Plans can now include participation supported with rewards and incentives. With account balances available, health plans can become an accumulating asset. Human Capital can be personalized with Corporate Humanity to engage employees in responsible ways within and outside of their health plan. Implementation of the newest generation of Healthcare Consumerism includes coordination with broader corporate attitude, support for personal responsibility, and active engagement of employees. Productive environments invite better health and vice versa. The health, productivity, and growth of a corporation in intertwined with the health and productivity of its employees. Healthy corporations grow. You do not need to tell a tree to grow. If it is healthy, it will grow. 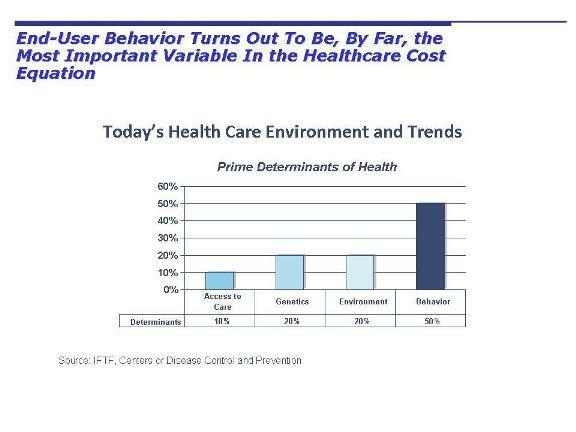 It’s time to recognize that health and healthcare costs do not stand alone within an organization. Health plan costs cannot be viewed as a single budgetary line item. We now know that the cost of healthcare is not only a function of the individual’s health, but the health, healthcare, and non-healthcare policies of the corporation. The interactive correlated effects of the broader corporation and the engaged individual drive more of the cost than most companies have previously appreciated or recognized. The effective implementation of Healthcare Consumerism is much more than a plan change. It may involve a corporate makeover in other benefit areas, a rethinking of the corporate treatment of staff, providing new support tools, creating opportunities for choices, and raising expectations and a requirement of personal responsibility by its entire staff.